Opeyemi Babatunde, researcher at Keele University, blogs about the challenges of making evidence from clinical guidelines or systematic reviews accessible and introduces “Evidence Flowers” as a novel way of providing a visual summary of research evidence. Evidence syntheses products (e.g. clinical guidelines, Cochrane and non-Cochrane systematic reviews) which provide a complete, exhaustive summary of current evidence have unquestionably moved evidence-based practice forward. The process of translating research evidence into clinical application, and ultimately improving patient outcomes involves the engagement of various stakeholders (some of whom have limited time and research skills), resources and actions1-2. There can be no engagement with research evidence however, without accessibility to the research evidence. 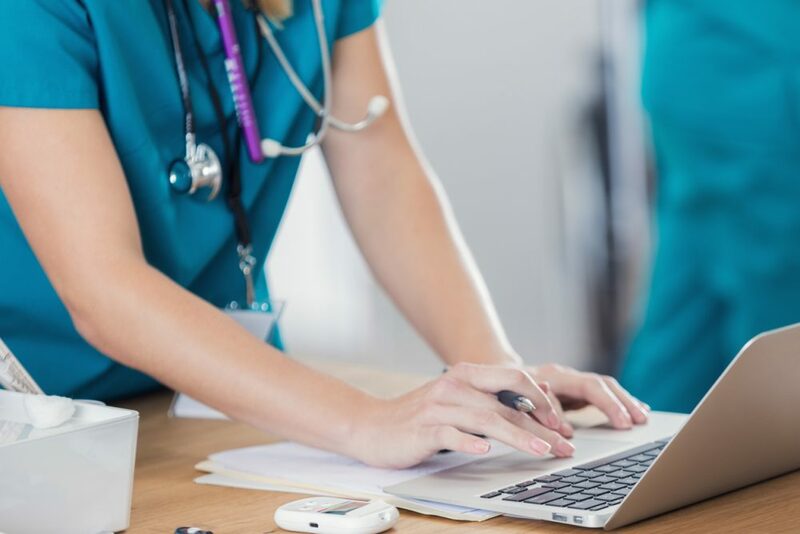 A considerable amount of skills, time (up to 2 years or more depending on complexity of the topic) and resources, are required for the production of systematic reviews and clinical guidelines. This is especially true for Cochrane Reviews due to the rigorous, and high methodological standards that are required in the review process. However, barriers such as, technical language, large volumes of text, and difficulties identifying key findings3-4implies that evidence from systematic reviews (despite being available in the public domain) are effectively accessed by only few. Many healthcare professionals have described information supply (from research evidence) as “overwhelming”, “difficult”, “daunting”, “time consuming”, “demanding” and “stressful” 5. Inaccessibility of evidence for patients, healthcare professionals, and commissioners is likely to result in research waste. Unless concerted efforts are made to distil research evidence, and present them in readily accessible formats for every stakeholder involved in healthcare, lack of access to and engagement with current best-evidence may continue to widen the evidence-to-practice gap, and drive ineffective or harmful patient care. One important question for proponents of evidence-based medicine is: how do the clinicians and/or stakeholders get hold of the main points from an evidence synthesis and possibly be enthused to find out more? Dawes and Sampson4proposed that information seeking is more likely to occur and be successful if access is convenient, information is reliable, of high quality, applicable and can be put into practice quickly. As a complement to currently available resources (e.g. plain language summaries) aimed at decreasing the complexity and amount of time to obtain information, Evidence Flowers6, were developed as a visual summary of research evidence from systematic reviews and guidelines. Research has shown that retention and recall can be enhanced by visual presentation of information7-8. Evidence Flowers (in the form of a flower, with petals bearing evidence of effectiveness of treatment and / or different outcomes of care), offer stakeholders easy access and insight into the amount, quality and conclusions of research underpinning healthcare recommendations. 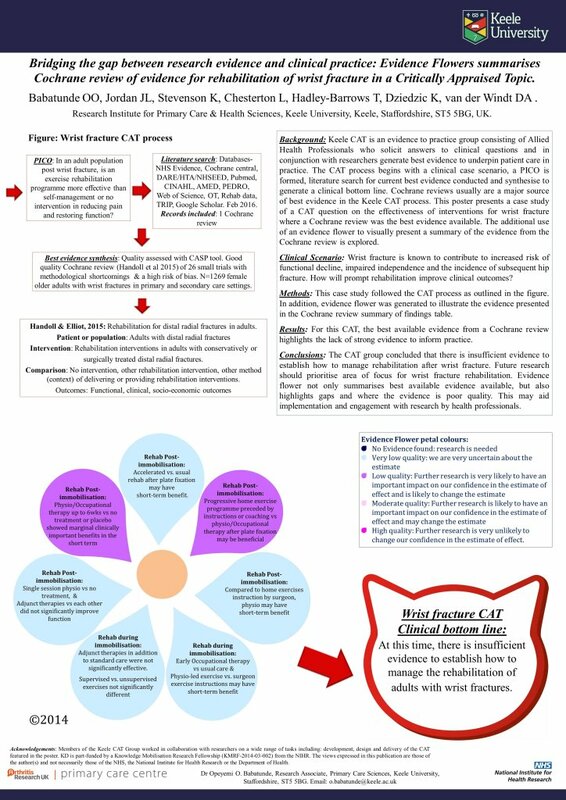 Evidence Flowers have been used to visually present findings of complex evidence syntheses with multiple outcomes, Cochrane Reviews and clinical guidelines in a succinct manner6. Designed and co-produced with user engagement and varied stakeholder inputs, Evidence Flowers have shown the potential to reduce accessibility barriers related to the speed of use, recall and retention of information contained in systematic review and clinical guidelines6. It is important to note however, that in its current format, Evidence Flowers are still being developed and refined. As such, many issues including inclusion of other information required for clinical decision making (e.g. estimates of effects and precision, patient values, and potential adverse effects) are being considered in future developments. Future iterations will also consider a multi-layer Evidence Flowers model, suitable for online (web-based) use and other smart applications which will allow the illustration of evidence-based recommendations alongside the strength and quality of evidence in top superficial layers, (ii) specific evidence summaries (including estimates of effects and precision, patient values, and potential adverse effects) in successive layers, and (iii) full evidence profiles and context underpinning the recommendations, with links to references in deeper layers. In further research on visual evidence summaries, we plan to increase accessibility, dissemination and engagement of varied stakeholders (including those with limited time and research skills) with best available research evidence. Aiming to i) increase the value of synthesised evidence such as Cochrane Reviews and guidelines, ii) reduce research waste, and iii) enhance the translation of research evidence for optimal health gains. Such initiatives can also save time for clinicians when accessing evidence, potentially reducing cost of evidence-based care to healthcare organisations and facilitating evidence-informed decisions in clinical practice and policy making. To promote access and engagement with research evidence, Evidence Flowers may be used in conjunction with other evidence synthesis products, such as (lay) summaries, evidence inventories, rapid reviews and clinical guidelines. With increased access to research evidence, such visual, succinct evidence summaries also have the potential to foster clinician-researcher-patient and public dialogue and engagement, in turn leading to better prioritisation of research questions and policies for patient benefit. 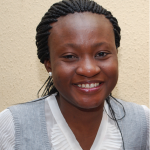 Join in the conversation on Twitter with @Yemi_Babs @CochraneUK or leave a comment on the blog. Dr. Babatunde reports grants and other from NIHR and Arthritis Research UK, during the conduct of the study; In addition, Dr. Babatunde has a patent Evidence Flowers pending. Petals of the example Evidence Flower in this blog was limited to two due to the low quality of available evidence (as presented) in that particular review. Other example Evidence Flowers presents with more varied range of quality profile (and distinct colours as in the key) have been presented in the published article (see ref. Babatunde et al. 2018 https://onlinelibrary.wiley.com/doi/abs/10.1002/jrsm.1295). Furthermore, it is true that colours have on attention, memory and recall. In order to further enhance accessibility and acceptability, selection of an optimal colour scheme is one of the issues to be explored in future research on Evidence Flowers .